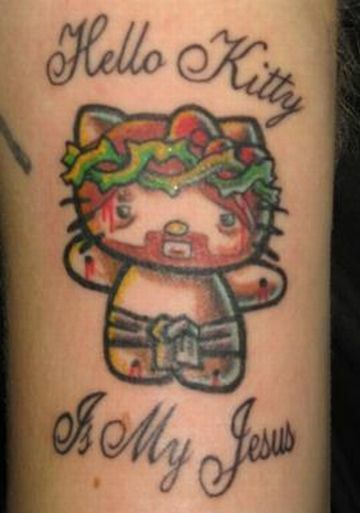 The Hello Kitty Jesus tattoo comes as another step ahead to show the Hello kitty worship. This is the cutest tattoo I have ever come across. The line ‘Hello Kitty Is My Jesus’ proves how much people love Hello Kitty and the heights of their devotion as well. We love this cute tattoo worship for its dedicated anthem and also for its fine work of art and thought. Truly, Hello Kitty is no less than a deity for its fans.